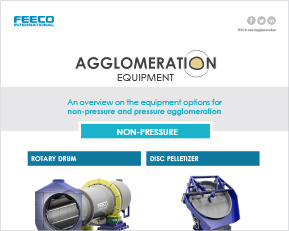 There are many choices on the market when it comes to agglomeration equipment. 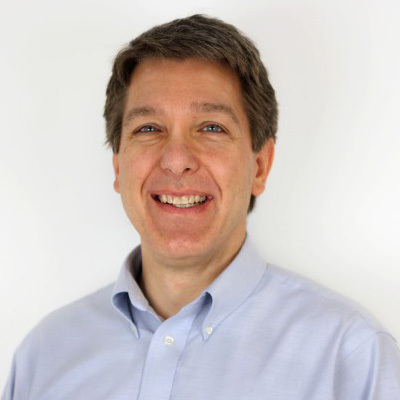 Additionally, new uses are being developed all the time, making current equipment options increasingly flexible. Below, we’ve provided a quick overview of some of the most common types of agglomeration equipment. Click on the image below to view our infographic on agglomeration equipment. Disc pelletizers are a type of non-pressure (tumble growth) agglomeration equipment. In the world of agglomeration equipment, the pelletizer is often chosen for its ability to fine-tune the product size, the process of which is a combination of both science and art. The pelletizer offers several variables, all of which can be adjusted, and work together to create the desired pellet. Material is fed onto the pan, where it is taken up by the rotation of the pan. Both material feedstock and a binder are continuously fed onto the disc pelletizer, making this a continuous process. The binder causes the fines to be tacky, allowing them to pick up more fines as they tumble on the disc. This results in an effect similar to rolling a snowball, referred to as coalescence. Agglomeration drums also fall under the tumble growth agglomeration category. Agglomeration drums are valued for their high throughput, and while they are used throughout a variety of industries, they are perhaps most common in the mining industry, due to their ability to accept variance in feedstock, and their heavy-duty construction, ideal for the demanding process needs of the mining industry. Here, they aid in the heap leaching process by promoting optimal ore extraction through more uniform particle shape and size. In addition, agglomeration drums can be used for specialty applications such as coating. Similar to disc pelletizers, agglomeration drums tumble material fines in the presence of a binder to promote agglomeration. Agglomeration drums can also be valuable when a chemical reaction is required during agglomeration, such as in the fertilizer industry. Here, agglomeration drums, referred to as granulation drums (or granulators), are fitted with a cross-pipe reactor, where liquid ingredients are combined and reacted, and then sparged into the rotating drum as a hot melt, where they then tumble and agglomerate as they simultaneously cool. Pin mixers are industrial mixers used for a variety of purposes, including: micro-pelletizing, conditioning, agglomerating, and mixing. These versatile mixers are particularly adept at dealing with fine materials, such as powders, and are optimal machines for mixing these fines with a binder. Pin mixers can act as a standalone agglomeration unit, or as the precursor to a disc pelletizer or agglomeration drum setup. Pin mixers use a high-speed spinning action to both mix and agglomerate materials in the presence of a binder. A single shaft affixed with rods (pins) rotates at a constant speed, creating a densified product through the use of motion. Like pin mixers, paddle mixers, sometimes called pug mills, are industrial mixers capable of conditioning, mixing, and agglomerating. Paddle mixers are also ideal solutions for processing material in the presence of a binder, though unlike pin mixers, paddle mixers are more suited to heavy-duty material processing, such as can be found in the mining industry. Paddle mixers, or pug mills, use dual-shafts with pitched paddles to create a kneading and folding over motion inside the mixer. This results in a thorough mixture of ingredients. Here again, paddle mixers can be used as a stand-alone agglomeration device, or as part of a larger processing configuration. Compactors are a type of pressure agglomeration equipment that operate on the principle that under extreme pressure, some materials will adhere to themselves. Compactors use mechanical force to press material fines into a compacted sheet, which is then broken up into granules. Compactors are frequently used in the fertilizer industry to produce fertilizer granules. Material fines are first fed between two counter-rotating rolls, which press the material into a compact sheet. The sheet is then fed through a flake breaker, followed by a granulator, which breaks the sheet up into the desired size granules. Though compactors can work with a binding agent, with most materials processed in a compactor, a binder is not needed. This is therefore considered a dry process and does not require a subsequent drying step, though this is not true of all compaction granulation processes. Similar to compactors, briquetters also use mechanical force to press material fines into a desired shape. Briquetters are typically reserved for instances where larger agglomerates are desired, such as in the making of water softener briquettes, or charcoal briquettes. Because small briquettes are difficult to make and have a low volume, the smaller the briquette, the higher the price of equipment. Typically, briquettes are produced no smaller than roughly a ½” square by ¼” thickness. Material fines are fed between two counter-rotating rolls. Each roll has one half of the desired “pillow” shape, and as the rolls come together, the halves unite, pressing the material into one complete pillow form. Here again, a binder is not necessary, but sometimes useful. The chart below provides a comparison summary of the agglomeration equipment discussed here. 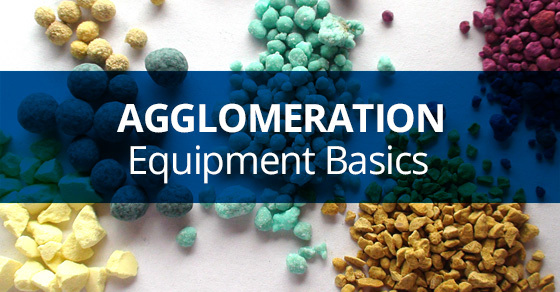 Which Agglomeration Equipment is Right for You? While the variety of options in agglomeration equipment may seem overwhelming, often the material characteristics and desired end product characteristics will help to narrow down the decision. 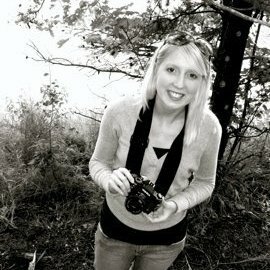 FEECO also offers a unique feasibility testing center, where we can not only determine if your material will agglomerate, but also what equipment configuration will be necessary to produce the desired end product results. FEECO has been a pioneer in the agglomeration industry since 1951. We offer custom agglomeration equipment and process solutions. For more information on our agglomeration solutions, contact us today!